Your client’s first impression of you normally comes from your design presentation. So you’ll want to wow them with your ideas, understanding of their visions and personalized approach. But it can be difficult to know how to present a landscape design this way, if you’re new to the presentation process. To help you hone your skills, here are seven swimming pool and landscape sales presentation tips. Before you meet with the client, make sure you are ready to present. You’ll need to prepare for the presentation at least one day before the meeting. That will help eliminate stress and give you the confidence you’ll need to discuss the project. Try running through your landscape sales presentation with an employee, friend, family member or by yourself. This will make you more comfortable talking about the design and also help you brainstorm questions the customers might have. You want to make the most of your time with the prospect, so know what you want to say. Plus, doing a test run of the landscape design presentation will help you remember all of the materials you need to bring with you. We get desperate calls every week from our designer clients saying they arrived at the presentation but forgot a file or didn’t register their landscape design software. Don’t let that happen to you. You’ll want to confirm your presentation appointment with the client the day before. That way, you can make sure you don’t drive to their house for nothing. Also, make sure all of the decision makers are present for the meeting. If they aren’t, one will be left trying to sell your services to the other, instead of hearing the information straight from you. Another important component when considering how to present a landscape design is incorporating exactly what the potential clients have told you in initial conversations. When they say they want things like a “cozy nook, ” “relaxing area” or “fun place for entertaining guests, ” write those words and phrases down exactly. Then, use those words when you present your plans. They will resonate with your client and help them connect to the space on a subconscious level. You’ll give them confidence that you really understand their vision — and also know how to turn it into reality. As for where to do your landscape design presentation, you have two basic choices: inside or out. Starting the meeting inside will help you keep the client more focused on the landscape or swimming pool design, instead of jumping from one area to the next outside. Plus, they’ll spend more time inside looking at the yard, which will help them see the views they’ll have of their new space. 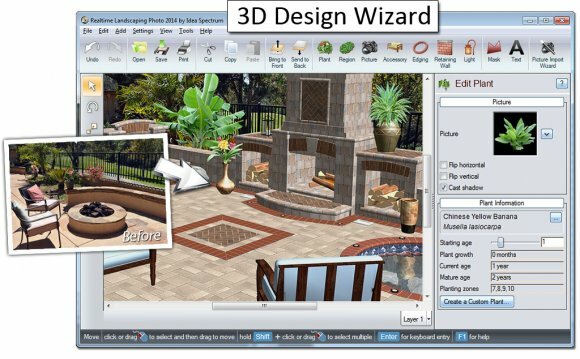 While inside, use our 3D landscape design software to show them the design. You can actually show clients views of the pool and landscape from inside their home with our software. Don’t miss the opportunity to sell your ideas from the most important vantage point. Once you’ve painted a picture of what the space can become from within, take them outside to cover more of the specifics. Walking the client through what the outdoor space can become is difficult when you’re carrying around rolls of plans. So impress them with a different display when presenting a landscape design. You can use a 24- by 36-inch foam board with binder clips, which will cost less than $10. That way, you can walk around the yard holding the display without continually asking them to hold one end of the plans while you point to features. Plus, it will be easier to look at inside on a flat surface. Or you can bring a plan reduced to 8 ½ by 11 inches and then take notes or mark changes on it. Another option that’s popular with our designers is to bring a tablet to show clients past project photos. You can flip through images as you walk around the property. Make sure the project photos you take with your smartphone and show to prospects will really wow them. While having the actual design plan is a must, materials like plant catalogs, hardscape samples and your portfolio might be a little overwhelming for the customer at your presentation.